The latest issue of Pet Food Supplement was published in April 2018. A printed copy is available free on request to qualifying readers or on payment of a fee to anyone else (see below for details). To see the content on-line, please click on the images below. 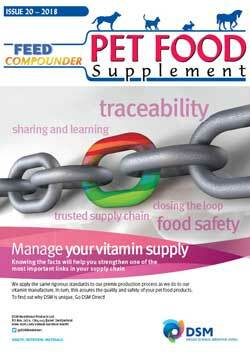 Pet Food Supplement is a regular journal for pet food producers and their suppliers. It is published annually and distributed free of charge on request to anyone involved in the pet food sector and based in Europe. Calling Pet Food Industry Suppliers! The next issue of Pet Food Supplement will be published in Summer 2019. Editorially, this issue will have a mix of articles and analysis; alongside these major features, companies who supply (or would like to supply) the pet food industry have the chance to promote their products and services. We are interested in in-depth articles about all aspects of pet food including nutrition, manufacturing technology, QC, legislation, marketing, packaging etc. Please contact us if you are interested in being included. Brief editorial items (up to a maximum of 250 words) for free inclusion are welcomed. Contributions may concern established products and services, case studies, new products, company and personnel news. Editorial must be sent by email to mail@pentlandspublishing.com or by post on disk. Alongside your editorial, we can also include photographs, for which there is a charge of £100, or your company logo in full colour for which there is a charge of £50. This is an ideal time to advertise to a rapidly developing and profitable industry. Rates are reasonable and we can guarantee favourable, high-profile positioning alongside editorial. Please contact us to discuss your requirements. Advertising rates can be downloaded in PDF format by clicking on the link below. Pet Food Supplement is distributed free-of-charge to senior management, nutritionists, production and QC personnel at major pet food producers in Europe (covering in excess of 90% of all production), and to subscribers to Feed Compounder – the leading monthly subscription journal for animal feed producers. It is also available at major exhibitions including Interzoo, Victam and VIV. Pet Food Supplement is available electronically and advertisers benefit from live links through to their websites and e-mails. Please feel free to contact us if you would like to see a copy of the latest issue, a media information pack or to discuss any aspect of the publication and how you might gain from it. 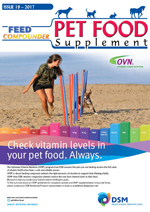 Pet Food Supplement is available free to subscribers to Feed Compounder magazine and to manufacturers of pet foods in Europe who complete a registration form. Registration forms are available for download in Adobe Acrobat Format (click link below). Pet Food Supplement is also available on subscription to interested parties who do not qualify for a free copy. To download a subscription form in click the link below.